Watch more thanks to faster conversion. Preserve your favorite films with zero quality loss. Get the best all-in-1 toolkit to burn, copy, edit, and download and more. Ultrafast Conversion, up to 30X faster than other converters on Mac. Preserve 100% of your original video’s quality after conversion. Native codecs ensure the best results when using iMovie, Final Cut Pro, Adobe Premiere & more. No media player is off limits - Export audio & video to 76 popular formats. Do it all – Convert video & audio; convert home DVD, burn & copy home DVD; edit and download video & more. Supported OS: Mac OS X 10.6, 10.7 or 10.8 Mountain Lion. automatically appear in iTunes, ready to sync. Optimized presets for iMovie, iDVD and Final Cut Pro let you convert videos to fit your favorite programs with a few simple clicks. The amazing Mac video converter handles the complicated settings for you. The Mac video conversion is extremely easy with a list of optimized presets for Xbox 360, PSP, PS3, Nintendo Wii, Walkman, Creative Zen, etc. You don't need to worry at all about the settings and resolutions for your devices. The video toolbox enables to convert MTS/M2TS files from AVCHD camcorders. Convert between a variety of video formats including WMV, MP4, FLV (Flash for posting online), AVI, MOV, MPG, MKV, MOD, DV and more. Automatically detect your Mac's multi-core processor to take advantage of your Mac's spare power. Batch processing enables you to convert several videos in one go, making quick work of even the longest conversions with Mac. PNG, GIF, ICO, and TIF) to videos. 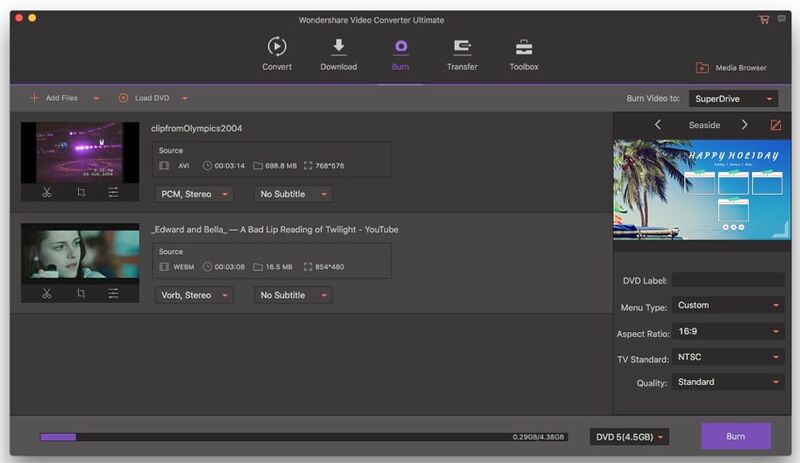 You can trim a file into multiple segments so that you can take whatever you want for the conversion & merge several video or movie files into one so that you can enjoy a long movie on your own without interruption. 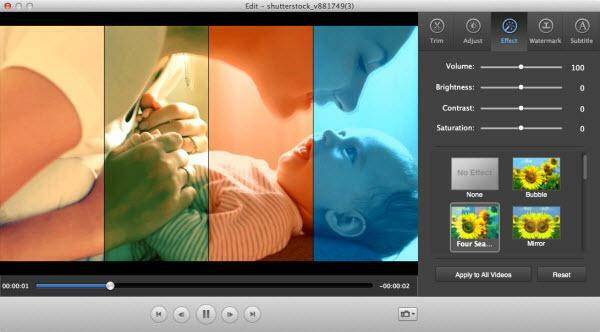 Capture current frame from videos, movies, or TV Shows to save your favorite scene in JPG image format on Mac. Quickly rotate an image by clicking the 90° Clockwise, 90° Counterclockwise, Horizontal flip or Vertical flip buttons. It has a very simple interface and keeps the confusing choices to a minimum. Supports drag-and-drop functionality and provide a huge range of presets for iPad, iPod, iPhone, Apple TV and more. Video conversion on Mac is now a breeze. 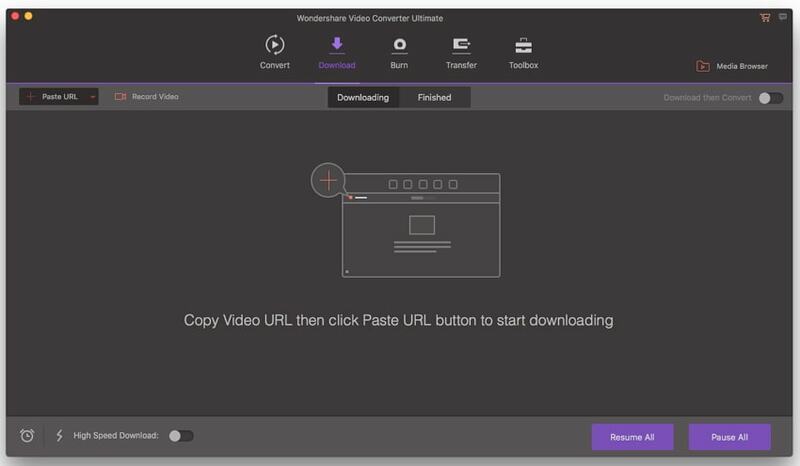 First, download Video Converter Ultimate for Mac and then install it. After launching this program, you’ll enter into the “Convert” interface by default. Then, you can go to “File” menu, and then choose “Load Media files…” option to import your local audio & video files, or select “Load DVD files…” option to add DVD files. Also, you can click the “+” button in the bottom-left corner to browse and add the files you want from the computer. However, the easiest way is to directly drag & drop audio, videos, DVDs, even videos downloaded from the websites to this program. Click the double up-arrow at the bottom of this program’s pane to open its output format list. Here, available output formats are well catalogued as: Devices, Editing, HD & 3D, Web Sharing, Video and Audio. Just feel free to choose any format you want. If you want to convert videos or home DVDs to iPhone 5, iPad mini and other various devices, you can choose a directly-optimized preset to fit your device best in the “Devices” category. Note: This app provides three professional encoders in the “Editing” category, Apple Intermediate Codec, ProRes and DNxHD. For those who want to convert files for editing in iMovie, FCP etc, no doubt, these naively-supported output formats by famous editing software will be their desirable formats of choice. Click the “Convert” button in the bottom-right corner of the main interface to start video conversion. During conversion, you can pause or cancel conversions easily. The progress bar will show you the conversion speed. Hit the “Burn” tab at the top to enter into the “Burn” interface, and then in the upper-left corner of the interface, you can switch to the “Burn DVD” or “Copy DVD” option, next, simply drag and drop the files you want to this app’s pane to respectively burn or copy home DVDs. Name your DVD and choose one of four output formats: DVD Disc, DVD Folder, .dvdmedia, or ISO file. For DVD burning, the extra step is to select one of your favorite DVD menu templates from the drop-down list at the bottom of the program window. Click the “Burn” or “Copy” button in the lower-right corner of the interface to start burning or copying DVDs. Once you’ve edited the file, you can click the "Preview" button to preview your DVD project first. If it's ok, then click the "Burn" button beside. To download videos from virtually any website, just click the “Download” tab on the top to use the built-in browser there to visit your wanted sites like YouTube, then search for and play your favorite videos. At this time, you have two different ways to download them. One is to just click the “Download” icon on the top-right corner of each video to add them to the download list, the other is to open its Media Browser first by clicking the “ ” button on the top-right corner and then directly drag the video URL to the download list in Media Browser. To edit video or audio files, simply click the "Edit" image button on each file bar and then you can trim, crop, rotate, watermark your files, add cool effect and subtitle etc. After editing, directly click the “Close” button to close the current editing window. Before converting files or burning DVDs, you’d better preview the editing effect by clicking the left video thumbnail of the file bar. When you’re satisfied, just continue converting or burning your files.